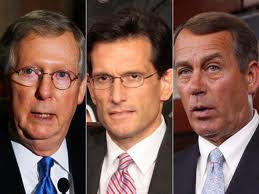 The Ostroy Report: "Jobs Bill Killers!!" That would be mean and Obama doesn't do mean. Republians do not want Amercians to go back to work!!! !They just want to stuff their poclets with Taxpayers money.I am not voting for any Republican they are stuck on stupid!! !